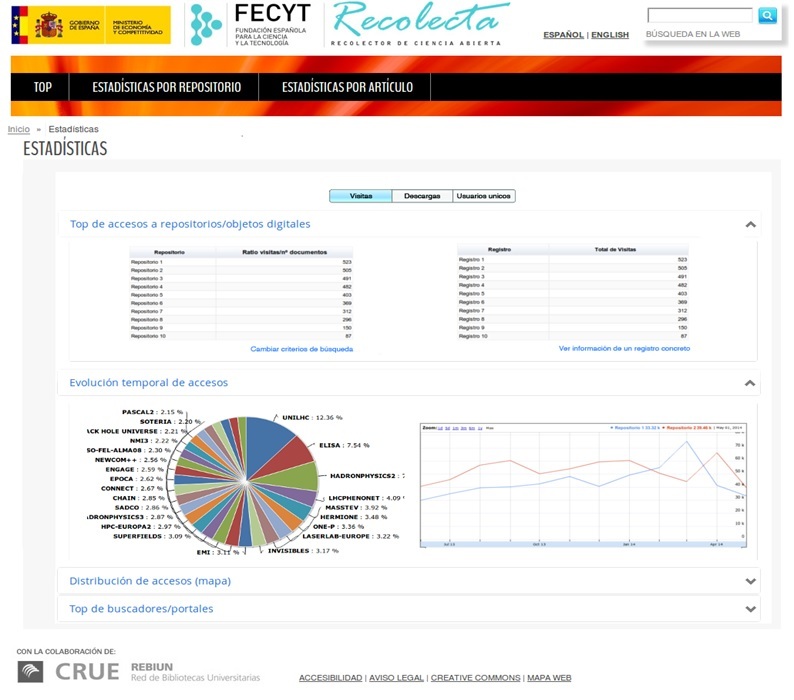 FECYT is working on providing system statistics of visits and downloads. Each repository provides its own statistical data according to established guidelines. FECYT has developed a validation tool to validate, harvest and display the data in aggregate form. 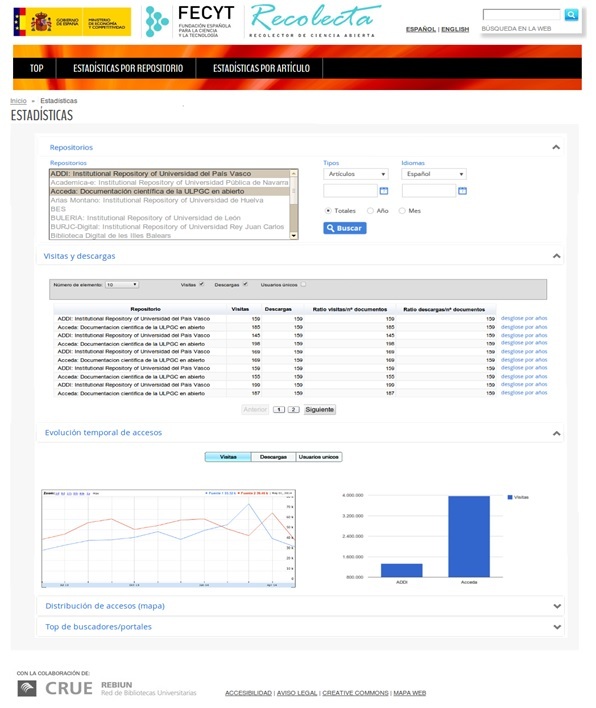 In the following link you can download the development of RECOLECTA for collecting statistical data from repositories, following the Knowledge Exchange (KE) guidelines and adapting them to the indicators established by RECOLECTA: Client OAS for Statistics. FECYT has developed a manual which specifies withwich managers each proposed solution is compatible with. Ranking (Top) of repositories and digital item by access number and downloads. Posibility switch between the options "Visits", "Downloads" and "Unique Users". Graphic representation of all repositories, temporal evolution of the top 10 repositories. This information is selectable by views, downloads and unique users according to the option chosen. 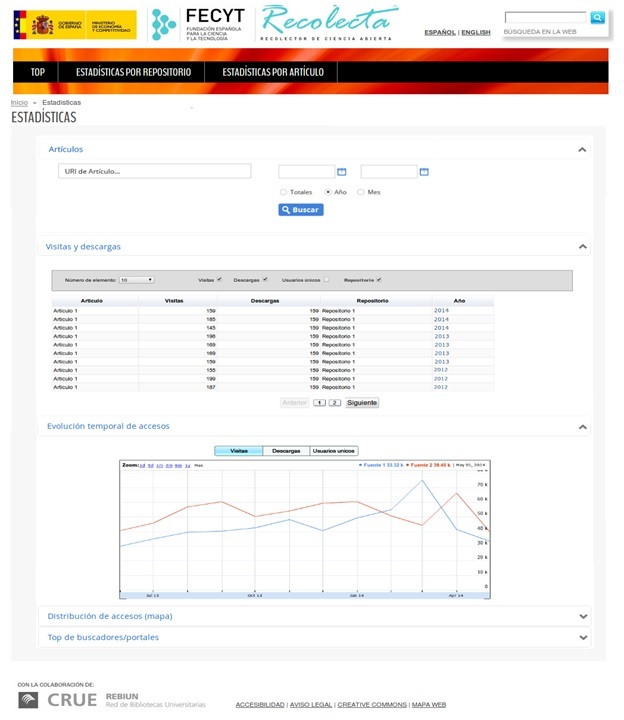 Table with the distribution of search engines / portals from where you can access the repositories. In addition, to obtain a higher level of detail of the statistics by repository and item you have to descend the page into the information. Table of repository access during the established date range. Temporal evolution of the repository by graphical representation applicable to searches with time interval in year / month lines. Geographical distribution of access of repositories. Item selection, where the URI (persistent URL, DOI, etc.) and the date range are indicated. Table of item access during the established date range. Geographical distribution of access of the repositories. Table with the distribution of search engines / portals from where you can access the item.